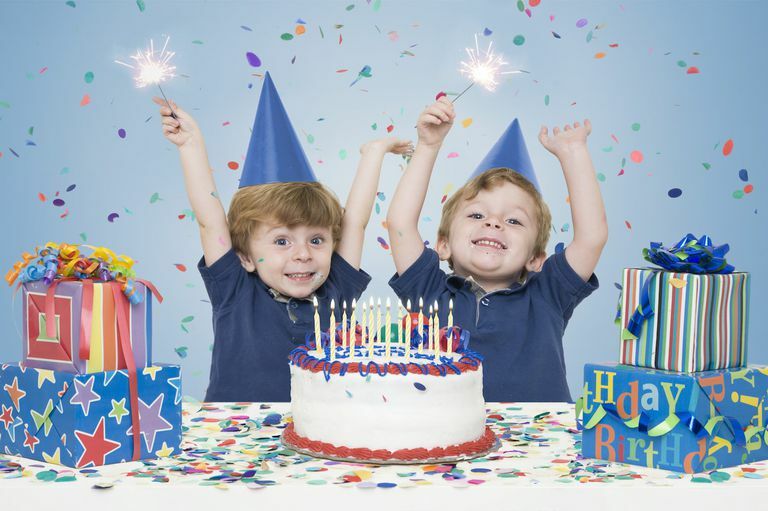 Birthdays are a big milestone for twins and other multiples. After all, it is one of the first things they share as they begin their life. Celebrating birthdays in a meaningful way that makes each child feel special and unique can be a challenge. Here are some suggestions to help make birthdays memorable and happy events for everyone involved. Limit the number of guests. A general rule of thumb for singletons is to invite one child per year of age, for example, three guests for a three-year-old, four for a four-year-old. That ratio is generally appropriate for multiples as well, although if you're ambitious and can afford to, it's not unreasonable to increase it proportionally for twins, triplets or more. Ensure that parties produce happy memories for both guests and hosts by planning age-appropriate activities. Two-year-olds don't really need circus rides and a magician; they will probably be overwhelmed by too much hype anyway. If it's your multiples' first birthday, surely you are the one that deserves a party! But as the children get older, allow them to have input into the party planning and preparation. Be honest with them about your budget and abilities and discuss expectations before you start planning. Some parents may wish to show respect for each child's individuality by creating separate events. One creative strategy is to celebrate a "half birthday" six months after the actual birth date. Talk to your children about their feelings. Many adult multiples say that sharing a birthday, and the associated festivities, is actually part of the fun of growing up as a multiple. When I suggested that my twin daughters take cupcakes to school on separate days, they were horrified. "No Mommy!" they exclaimed. "It's both our birthdays and we want to be together." Birthdays can be one of the few ways that parents of multiples actually catch a break. It is certainly easier to plan — and pay for — one party per year than two separate events. Professional party services will generally charge the same amount for a twin birthday party as for a single child, with perhaps a small additional fee for the second set of balloons or an additional commemorative T-shirt. One of the biggest dilemmas for parents of multiples is whether to provide a separate cake for each child. Once multiples are old enough to have a preference, certainly they should determine the answer. For younger children, cupcakes are an easy solution. It is my opinion, however, that all children deserve to hear "Happy Birthday to You" sung in their honor, and that it should be delivered separately — all the way through — for each child. In some cases, a single gift that can be shared may be more fun than individual items. A board game, video, or sandbox are all examples of this type of gift. In other instances, it's appropriate to give presents that are similar in a category but unique in detail, such as dolls with different attire or trucks in different colors. However, sometimes it's easier all around to just give everyone the same thing; it's one less thing to argue about!